If you are venturing from Atlanta or anywhere in the Southeast this fall to the Blue Ridge Mountains to see the glorious leaves changing from green to yellow to orange to red, a must-stop is the Farm To Flame food truck. It travels around but most often is at the Appalachian Mountain Brewery and Watauga County Farmers Market on Saturday mornings. 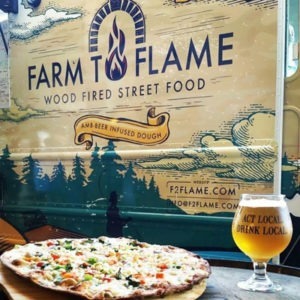 Originally started as a nonprofit focusing on local farmers, Farm To Flame features a new local farmer each month and collaborates on a menu item that uses only local ingredients from the farm. Selected farmers are able to market themselves all month on the truck, plus they get all the proceeds from the item on the menu. The amber beer-infused crust of Farm To Flame’s breakfast pizza is thin, crunchy and perfectly cooked in the wood fired-oven. It is the epitome of farm-to-fork. The guys shop the freshest ingredients each morning at the farmers market like fresh eggs, organic ground sausage, kale, red onion, peppers, goat cheese and fresh herbs. I was a little skeptical about a breakfast pizza, but it was absolutely delicious. The light drizzle of maple syrup and hot sauce pushed it right over the top! 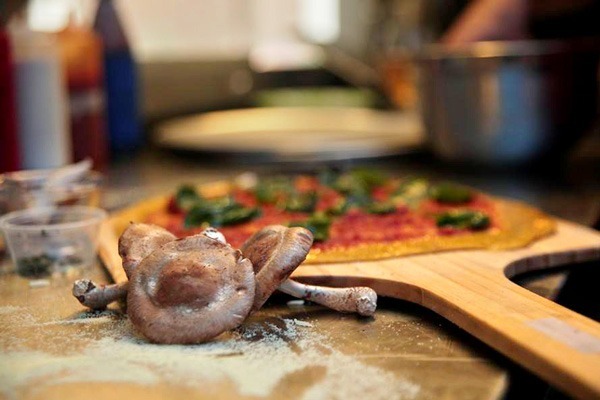 Of course their other pizzas like the Veg Out, Italian and Buffalo Soldier are just as good—especially with a cold draft beer from the Appalachian Mountain Brewery.